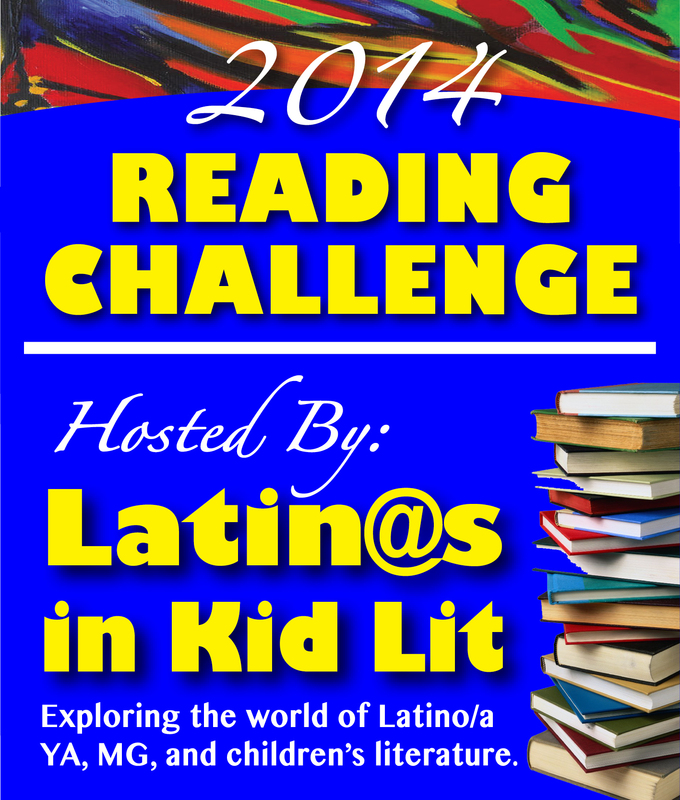 JOIN OUR 2014 READING CHALLENGE! Re-reads and crossovers from other challenges are fine. You may select books as you go. You can join at anytime during the year. Any books you have read in 2014 can be added. Prizes will be given to those who stick with it through the year! Any format, level (children’s, MG, or YA), or genre is welcome. The book, however, must be written by a Latin@ author and/or include Latin@ characters, settings, themes, etc. “How will I find such books?” you ask. Browse our book lists and “Great Resources” tab for possibilities. Read School Library Journal’s Top 10 Latino-themed Books of 2013. Latinas 4 Latino Lit put out its own list of Remarkable Latino Children’s Literature of 2013 when the annual New York Times Notable Children’s Books list failed to honor a single book by or for Laint@s. They also offer book suggestions throughout the year. Search through the Pura Belpre Medal winners. Check out the winners of the International Latino Book Awards. The SLJ has a list of top prizes in various categories here. If you’re like us, then you will be reading anyway because you’re a person who loves books and children’s literature, in particular. Why not challenge yourself to add some Latin@ literature to your TBR pile? We hope you join us! A great way to publicize and promote our Latino authors, characters, and viewpoints. I’ll do my part by reading and sharing! More important than ever with the NYT’s Book Review failing to address the issue that its own reporters covered last year. Not a single Latin@ author or protag on this year’s “Notable Children’s Book” list: http://nbclatino.com/2013/12/04/opinion-no-latino-childrens-literature-in-annual-book-list-again/ (link also has a great assortment of titles eligible for the challenge). Great! Thanks for joining us, Elizabeth! Yay, Robin! Thanks for joining our challenge! Great! Thanks for joining us!! I’m in, I think this is a great idea! My only personal restriction is that I won’t review any book published in 2013 (for conflict of interests) but I will try to do all 2014 books if possible. I posted the challenge in my facebook page, and i will send you the link to reviews as soon as I re-open my blog, which i had closed in 2013. Thanks for the challenge! I think this is awesome I have already spread the word thorough Twitter wordpress and google. Thanks to everyone who has signed up! We’re very excited! Great! Can’t wait to see what everyone reads! I will be participating at Kristi’s Book Nook (http://kristisbooknook.blogspot.com) This is a great idea! Pingback: Taking Action to Make Children’s Literature Better for People of Color | I'll get there. It'll be worth the trip. What a great idea! I’ve missed 2 1/2 months already (just found this on Kristi’s Book Nook). Hoping to start this month and post on my blog. Great! Thanks for joining us! Be sure to send us a note or link when you post something so we can share it on our monthly round-up post. You can leave it here or send it through our “Write to Us” section.